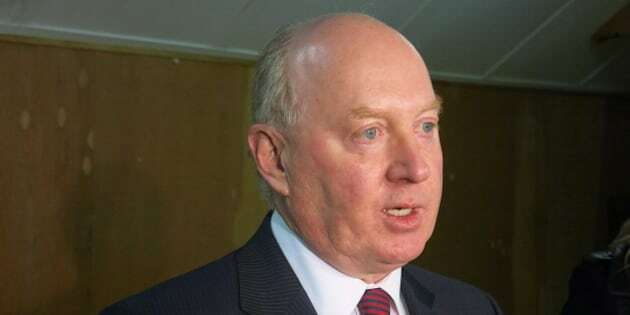 CALGARY - Former Alberta cabinet minister Ken Hughes quit the race Monday to become the next leader of the governing Progressive Conservatives, saying he will now support soon-to-be announced candidate Jim Prentice. Hughes told reporters last week that he was in the race to the end, but now says it's clear that there is a "strong consensus" forming within the party around Prentice and that he is the best choice. "More importantly, the province needs the kind of strong leadership that Jim Prentice can provide," said Hughes. "This was a decision based upon my judgment about what is right for Alberta." Hughes said he's been friends with Prentice going back four decades and knows him well. "He is a thoughtful, determined person who understands the world of business, understands the needs of Alberta and really brings to the table an exceptional profile," said Hughes. He said he wasn't pressured by anyone to leave the race, which officially begins Thursday with voting set for September. He said he communicated his decision to Prentice on Saturday, but didn't say what Prentice said in return. Hughes departure leaves former transportation minister Ric McIver as the only formally declared candidate. Prentice, a former Calgary MP and federal cabinet minister, is expected to announce in the coming days. Hughes said he also let McIver know that he was withdrawing from the race. "I've told him what I've told others, that I am doing this and why I am doing this." He said the looming $50,000 entry fee did not deter him. "We had a lot of people who were prepared to line up and support us with adequate resources." Hughes, the rookie member of the legislature for Calgary-West, has experience in business and as a federal MP. He stepped down last month as municipal affairs minister in order to avoid a conflict of interest in the leadership race. His decision means the field of potential candidates continues to shrink while the number of Tory members backing Prentice is growing. Late Sunday, Justice Minister Jonathan Denis announced he will not run and will support Prentice. Finance Minister Doug Horner and Energy Minister Diana McQueen announced last week they won't run either but will support Prentice. Jobs Minister Thomas Lukaszuk said Monday he is still weighing his options on whether to run. Lukaszuk said it was "unfortunate" that Hughes has dropped out. "He was offering a legitimate choice, and we knew what he stood for, and we knew what his platform was, and he had a well-known track record on provincial issues and policies," he said. He said a healthy leadership race strengthens a party. "It is not only good for the party, but it is imperative for this province and for Albertans to be able to choose who their premier is going to be, and have a real choice of candidates." McIver announced his candidacy last week, stepping down from his post as infrastructure minister. The 55-year-old rookie Calgary member of the legislature and former longtime Calgary city councillor promised a populist grassroots campaign to reverse the trend toward entitlements and perks. He could not be immediately reached for comment Monday. The other MLAs supporting Prentice are: Neil Brown, Dave Rodney, Robin Campbell, Manmeet Bhullar, Linda Johnson, Greg Weadick, Fred Horne and Kyle Fawcett.